Coconuts also contain coconut water aside from the well-known coconut milk. However, you do not get coconut water by squeezing the pulp of a ripe coconut but rather by taking it from the cavity from a young coconut. The younger a coconut is, the more coconut water it contains. A mature coconut contains only 100-200 mL of coconut water, while a young fruit can contain more than half a litre (Figure 1). Figure 1: Young Coconut (left) and old coconut (right). What is interesting about coconut water? Coconut water is a low-fat, low-calorie (17-20 kcal) drink with isotonic properties. Isotonic means that it has the same osmotic concentration as human blood. This is determined by the nutrients present. The composition of the nutrients changes according to their age. The here presented values result from our research. The contents can vary due to natural fluctuation, species and age. While coconut water from young coconuts (5-6 months) has a very high glucose content of 35.4 mg/mL, coconut water from mature coconuts (≥12 months) contains only 21.5 mg/mL. The fructose content also decreases from 39.0 mg/mL to 21.5 mg/mL during aging. Interestingly, the opposite applies to sucrose. Here the content rises from 0.9 mg/mL to 14.4 mg/mL. Measuring the sucrose/glucose ratio is therefore a viable method to determine the age of the fruit from which the coconut water is taken (Figure 2 and 3) . Figure 2: 1H-NMR spectra of coconut water: comparison of carbohydrate signals of coconut water originating from young (top) and old coconut (bottom). Figure 3: Glucose, fructose and sucrose content in young coconut and old coconut. What are the practical results? We examined coconut water from old and young coconuts (fresh fruits) and then a series of bottled coconut waters. We were able to ascertain that all of the 7 examined fruit juices showed the characteristic pattern and clearly came from a coconut. Compared to the literature and the experimental data, it became clear that two different types of coconut water were present among the samples: 3 of the samples showed the characteristic sucrose/glucose ratio for young coconut water, while 3 of the samples showed the ratio that can be detected in the water of the older coconut. One sample had a sucrose/glucose ratio in between. So, does coconut water contain only sugar? No, since coconut water serves as a water reservoir for the coconut, it is enriched with a large amount of minerals, especially potassium, magnesium, calcium and vitamins. Amino acids such as alanine or valine and fruit acids such as malic acid are also present in the fresh and processed coconut water. This makes it the ideal sports drink. Fresh from the young nut, it is even germ-free and can be used to clean wounds. 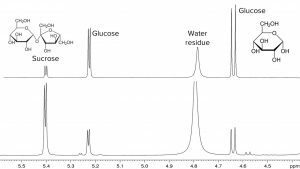 The 1H-NMR spectrum of fresh young coconut water is presented in Figure 4 with the details in Figure 5. Figure 5: 1H-NMR spectrum of coconut water originating from a young fresh coconut in detail. Just one method to detect everything? By using the 1H NMR spectroscopy a holistic control of coconuts may be performed. 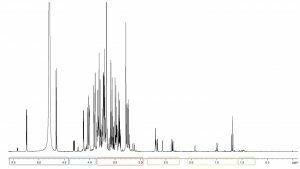 It is possible to detect organic acids, amino acids, sugars and several other characteristic components within a sample which is prepared only once! By adding an internal standard, it is even possible to identify and quantify the sample simultaneously! It couldn’t be simpler and faster! 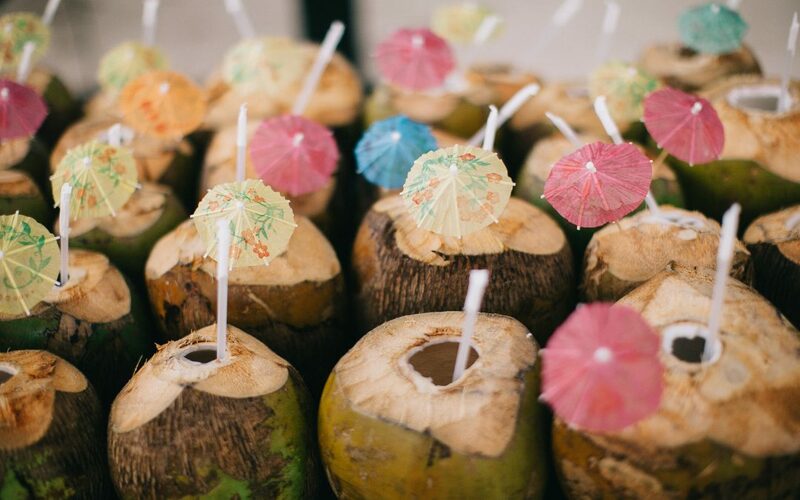 : Tan et al., Composition, physicochemical properties and thermal inactivation kinetics of polyphenol oxidase and peroxidase from coconut (Cocos nucifera) water obtained from immature, mature and overly-mature coconut, Food Chemistry 142 (2014) 121–128. 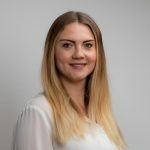 The research and this article were performed by Luisa Seyerlein within her traineeship at Spectral Service AG in February and March 2019. We would like to thank Luisa for her excellent work and express how much we appreciate her efforts. For your Master thesis, we wish you all the best, Luisa! Edible oil – Which one is it?